Web Sites on the internet are replacing those references that were used everyday, the key reference was the business telephone book ( Yellow Pages for some, The Green Book in Singapore). However the internet is so large that - well you cannot thumb through the internet - you use a search engine. Hence the power of Google, Yahoo and Bing. Whether you are looking to be contacted locally or world wide from prospects finding your website, the search engine spiders need to be able to read the content of your web site and index that information so that they can match up an enquiry with your web site. Simple as it seems, often websites are built using technology that spiders cannot copy the content. The most famous site for this was Nike home page, (www.nike.com) it is not much better today. The content on the home page has no reference to their business and recently when checked contained a list of countries. Nike probably does not need to worry, but the majority of business on the web do not have the presence, Tiger Woods and the marketing budget to be already highly pervasive. At IT Consulting & Services we have many years experience in building and maintaining web sites. On building web sites we ensure that they are Spider ready, that the balance between content for the the spider and Multi-Media for the visitor is attractive and compelling. Above 1001 pages — by negotiation. titled; The New Rules of Usability. The study concluded that there is a significant relationship between visual asthetics and usability. A well designed page would be close to 30% graphics, 30% text and 40% white space. This is a significant conclusion as often clients and prospects have passionate views espeically those who prefer everthing to be graphic. 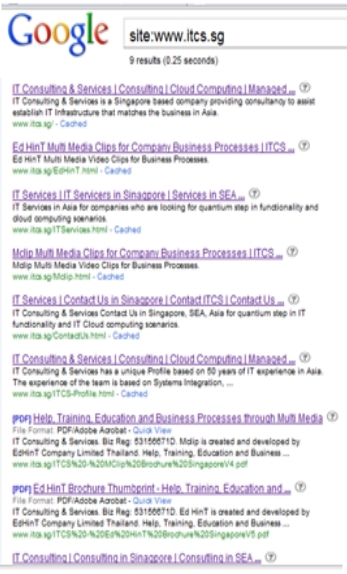 However with the Search Engines - no words, no content and consequently no index entries. The report stated that people are both task-orientated and lazy - the credibility and purpose of a website is assessed in as little as five seconds and most pages are quickly scanned for links and headlines. Navigation and menues address this dualism with a simple way for people to complete tasks without requiring a lot of reading or scrolling. For the four categories of business web sites covered in the report there were challenges, because each industry had to grapple with a unique set of conditions. There tends to be patterns in how each industry make use of the available visual space. So T&H tended to be made up of more graphics and white space than the text heavy university or ecommerce sites. Page Length: a web page that requires that a user to scroll through more than two screen lengths ( approximately 1300 pixels) is probably at a limit. B2B and T&H sites tended to have minimal content and tended to be shorter in length compared to e-commerce and higher education. Navigation: Horizontal navigation has become the mainstay of web design as it preserves valuable real-estate. However T&H more often deviate from this norm relying solely on vertical navigation structures. E-commerce and higher education sites often utilise both horizontal and vertical navigation. But 9 out of 10 times top level items where displayed in horizontal menus. Graphics: The composition of a page is built around graphics, links and text. T&H sites focued on large central images, where as e-commerce sites used multiple sections to make the content more scannable.